Abstract. Each year, numerous species thought to have disappeared are rediscovered. Yet, do these rediscoveries represent the return of viable populations or the delayed extinction of doomed species? We document the number, distribution and conservation status of rediscovered amphibian, bird, and mammal species globally. Over the past 122 years, at least 351 species have been rediscovered, most occurring in the tropics. These species, on average, were missing for 61 years before being rediscovered (range of 3-331 years). The number of rediscoveries per year increased over time and the majority of these rediscoveries represent first documentations since their original description. Most rediscovered species have restricted ranges and small populations, and 92% of amphibians, 86% of birds, and 86% of mammals are highly threatened, independent of how long they were missing or when they were rediscovered. Under the current trends of widespread habitat loss, particularly in the tropics, most rediscovered species remain on the brink of extinction. Ploceus aureonucha. The correct dates should be 1994-2006. There is a bigger gap whre the species was not recorded for 60 years, from 1926-1986 (see Wilson M, Payne RB, Payne LL, Baboaineki S. 2007. First record of Golden-naped Weaver Ploceus aureonucha in Uganda. Bulletin of the African Bird Club 14:200-202). Ploceus megarhynchus. The missing years seem to be based on a wikipedia account: "The weaver bird Ploceus megarhynchus was originally described from a specimen collected by A. O. Hume from Kaladhungi near Nainital in 1869. 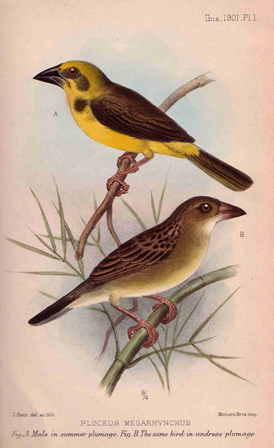 It was rediscovered near Calcutta by Finn and E. W. Oates called it Finn's Weaver around 1889-90". The year 1889 clearly refers to Oates' name and not to Finn's re-discovery in 1900. In any case, there is a specimen record from January 1876 (Catalogue of a collection of birds belonging to H.B. Tristram. 1889). Figure: first illustration of Finn's Weaver Ploceus megarhynchus (from Finn F. 1900. Ibis 8(1): 29-32).